Just yesterday we saw the newly designed inbox for Gmail. While that hasn’t yet been rolled out to all Android users, iOS users can get a taste of the update already. The update received for the Gmail for iOS packs in all the features that were seen in the yesterday’s update. This update gives options to have your mail automatically sorted into categories: Primary, Social, Promotions, Updates, and Forums. Not to forget the swipe-in navigational menus. The Gmail for iOS app, through this update, received more control for notifications. You can now choose to receive notifications for all messages, only important messages, or none at all, on a per account basis from within the app. 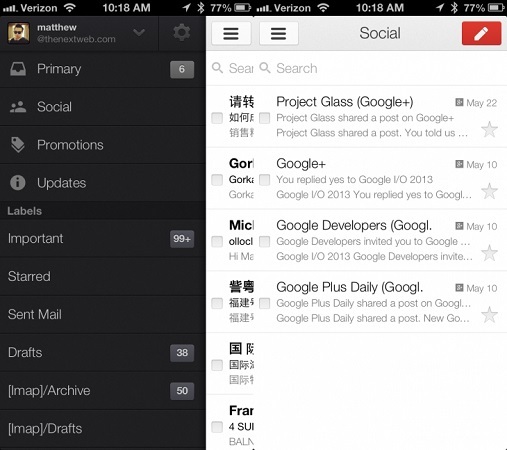 You can download the Gmail for iOS from the Apple App Store.